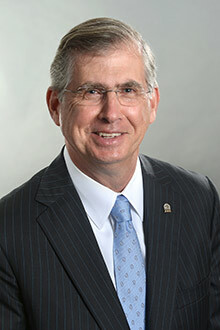 Chairman and CEO of SunTrust Banks Inc. William H. Rogers Jr. has been elected to the Board of Trustees at Emory University. William H. Rogers Jr., chairman and CEO of SunTrust Banks Inc., has been elected to the Board of Trustees at Emory University. Rogers, who has served as chairman and CEO of SunTrust since 2012, joined SunTrust in 1980 in the commercial banking division. He served in senior positions in corporate and commercial banking, corporate finance, private wealth management, retail banking and mortgage. Rogers has led a significant transformation of the purpose-driven company, advancing the financial well-being of clients and communities. Under his leadership, SunTrust has achieved five consecutive years of performance improvement. Rogers also played a significant role in the SunTrust partnership with the Atlanta Braves to sponsor the new Atlanta Braves stadium, SunTrust Park, which opened in March of this year. To engage fans and visitors to SunTrust Park and the Battery Atlanta, SunTrust opened The onUp Experience, an entertainment experience that promotes building financial confidence. His community and civic involvements include serving as a board member of the Boys & Girls Clubs of America, board chair of the Commerce Club, board chair of Achieve Atlanta, a trustee of the Woodruff Arts Center, a member of the Board of Advisors of Georgia State University’s J. Mack Robinson College of Business, a member of the Global Board of Directors of Operation HOPE, member and former chair of Atlanta Committee for Progress, and former member of Emory’s Board of Visitors. He is also a member of the Federal Advisory Council of the Federal Reserve Bank of Atlanta. Rogers was included in Georgia Trend’s 100 Most Influential Georgians of 2017, was named an Atlanta Business Hall of Fame Laureate by Junior Achievement of Georgia, honored as a Distinguished Alumni by Georgia State University, and in 2016 named the Most Admired CEO in Financial Services by Atlanta Business Chronicle.